Signed up for this race a long time ago. I have not run over 2 miles since my full marathon two months ago. This was part of my 19 mile training run for the Maui marathon. I ran to the start then ran the half marathon. My first Indiana trail race and my sister’s first trail half marathon. It had been raining prior to the race so the trails were super muddy. The course was flat, with only 3 “hills” that required walking. There were a few areas that had switch backs as it climbed the hillside. Though it was flat, by the time mile 10 hit, we were exhausted. I wasn’t used to the 75 degree humid weather nor the mud nor running this much on a trail race. This was the farthest my sister had run on a trail. This was organized by the Hoosier Hiker’s council. There were no timing chips – it was old school that everyone ‘starts’ with gun time and then finishing they will input your bib into a sheet along with the time, then a section of the bib gets put on a string in the order that folks came in. This is similar to the 5 mile turkey trot I did last fall. The aid stations were plentiful (5 for the half marathon) and contained only water and gatorade. The finish had chips, pretzels, cookies, bananas, popcorn, and gatorade. Unfortunately, everything was stale because of the humidity. We had fun getting muddy. I had a really hard time before the start deciding, which trial shoes to wear. I chose the known of two evils (lesser of two evils). The Solomon S-labs were not broken in and the last 8 miles I ran in them cause blisters and a weird ache in my right foot. So I went with the Newton Boca AT that are too small and cause bruises on my big toes. Luckily there were no hills so my big toe didn’t hit the front of the Newtons except for one downhill and thus no bruising. After this race, there was a noticeable pain in my left ring toe, which may have been caused by the shoes. Also, chose the Newtons because there was a stretch of the race that was on road and there are little cushion in the S-Lab, though the distance was short and I would have been fine in the S-lab in that respect. Orange Mud Double Barrel Hydroquiver – I never run a trail without it!! Morning Of: Oatmeal with rasins, crasins, almonds, brown sugar and cinnamon; 1 cup hot caffeinated tea with splenda. During: 1 package Pro Bar Bolt without caffeine; water; Gatorade at aid station mile 11. 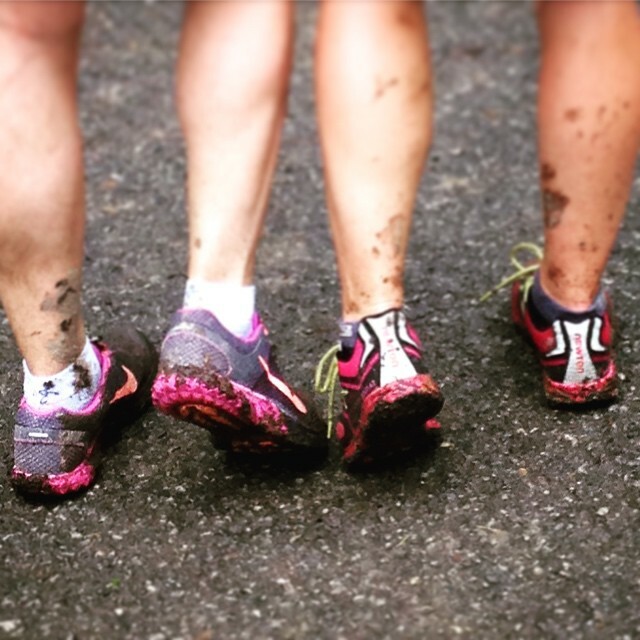 During: No pain or soreness during; tired; warm (75 degrees, humid); muddy. Post Race: Stretched well after the race. Back was tight; left ring toe hurt when pedicurist put acetone on it. The race directors predicted 1300-1600 feet of elevation gain, but Nike plus said it was a little less than 1200. Water, sun, streams, technical trails and food! This was a spur of the moment event only because stars aligned. On Thursday, I saw an advertisement for the Folsom trail race and something in the ad said Roseville, which made me realize that it was taking place the same day I would be in Roseville! I signed up the morning of the race and loved that everything was familiar in a new location – they have great signage (like for gear check and bib pickup) and it’s always a small affair without lines. The only line I queued in had been to pay the park entrance fee because I had arrived just 30 mins before the start. This also happened at the wood side crossover. A point to remember for future races that are in parks. The dams and lake were refreshing and awe-inspiring. It’s a part of California unexplored by me. The 10K and half marathoners started at the same time and ran on the same track. This was an out and back trail race with aid stations at Mile 3.1 (at the 10K turn around) and then one at 6.55 (Half Marathon turn around). Three aid stations for the half marathon is more than past races I’ve run. It provided me the opportunity to test out eating a PB&J sandwich at mile 3.1. About 2 miles to the half marathon turn around, my pace was easy when the leader of the half marathon passed me and then noticed the second place leader pass around 1.5 mile to the turn around. This made me think of a modification to the common math problem they’d give out in high school class… two trains traveling toward each other, each going x and y pace, at what point would they meet. Instead it should be Two runners are running on an out and back trail, with a turn around at mile 6.55, and each runner is running x pace and y pace. At what point will they cross paths? 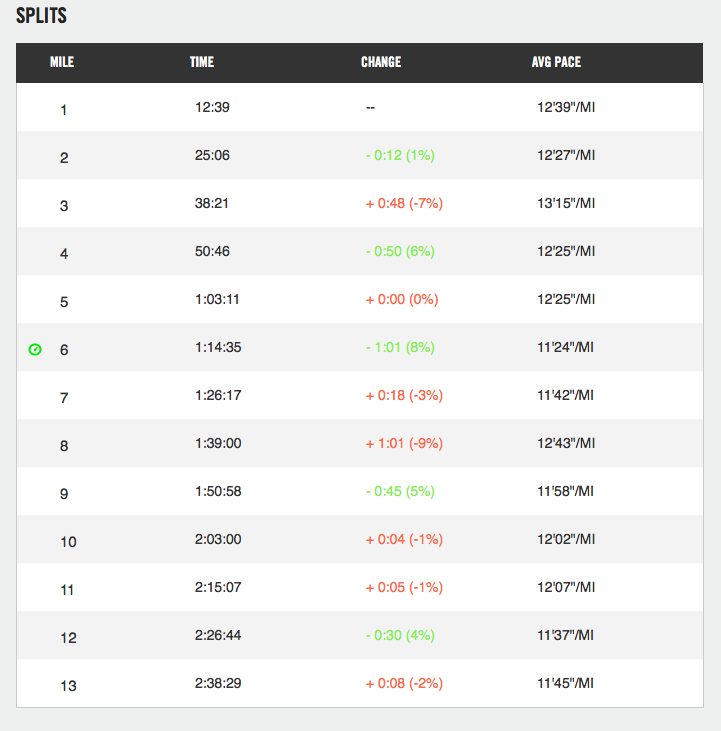 The 10K trails (first and last 3.1 miles) were wide for the most part and not that technical. The trail became narrow and more technical after the first aid station. The overall course had many inclines and descents; A relatively flat course (~900 ft elevation gain) compared to previous races, nothing that I would call a hill. The food was varied and plentiful both at the aid stations and the finish line. Another great race by inside trails. Morning Of: French Fries, Oatmeal with crasins, almonds, brown sugar and cinnamon; 1 cup hot caffeinated tea with splenda. Right After: Chocolate Milk, Ate carbs (fritos, etc), PB&J; Ate meat, French fries about 1.5 hours after. During: Hamstring outer knee knob pain.